"Jack Reacher" is a different film than you would expect. It's a different film than many will be expecting, with the possible exception of those already engrossed in the Jack Reacher books by author Lee Child, but even the fanatics might be puzzled by a few of the new details required to turn a page-turner into a Tom Cruise starring vehicle. There's a bite to the picture that's most welcome, hitting with a surprisingly hard PG-13-level of violence that gifts the tale a cold stance of intimidation. But there's also a story, and it's a thick one, with motivations, last names, and vague supporting characters all vying for attention in an already crowded movie. "Jack Reacher" has moments of inviting escapism, but it's also a mystery of debatable importance. In the end, writer/director Christopher McQuarrie makes an engaging feature, but often chooses the wrong elements to emphasize. When Barr (Joseph Sikora), a troubled military man, is framed for a cruel sniper rampage that kills five people in the heart of Pittsburgh, his lone request is to call Jack Reacher (Tom Cruise). With Barr's lawyer, Helen (Rosamund Pike), bewildered with the name, and Detective Emerson (David Oyelowo) suspicious of his intent, Reacher rides into town, eager to comprehend the damning accusation. A former Army investigator who's elected a life as a drifter, Reacher is skilled and aware, bonding with Helen as the two work through the clues, with the enigmatic outsider figuring out who to trust and who to beat into submission. Greeting suspects both meek and aggressive, Reacher is determined to find the mastermind behind such a heinous act, soon coming up against enforcer Charlie (Jai Courtney) and fingerless crime boss The Zec (celebrated director and the curdled voice of German doom himself, Werner Herzog). "Jack Reacher" is an interesting combination of a mystery and actioner, without ever settling on a consistent tone that elevates the viewing experience. However, it's not much of a puzzler at first, detailing Charlie's work as the sniper in question, passing on the potential of a whodunit to massage the question mark of the titular character. A confident, intelligent, and persuasive man, Reacher isn't the behemoth Lee Child originally conceived, yet in Cruise's care the man is a believable bruiser, willing and able to crack skulls to get what he wants. The former military cop isn't looking for a fight, but he's willing to finish one, highly trained in hand-to-hand combat and skilled with firearms, making him an unusual hero who doesn't possess a credit card, shops at Goodwill, and travels by bus. No wonder Helen spends much of the movie completely baffled by his actions. Cruise delivers awesomely irritable work as Reacher, chewing on McQuarrie's broad dialogue like an un-lit stogie, while selling the character's ease with physical confrontations with ideal Cruise-branded passion. It's an amusing performance, but so is McQuarrie's film at times, enthusiastically diving into its urban western atmosphere, setting aside a great deal of the run time for threats and stand-offs, while its suspense carries a decent amount of surprise. A mid-movie car chase turns into a citywide game of tag, where Reacher uses his automobile to commence a demolition derby with cops and the bad guys, spinning around city streets while figuring out an exit plan. It's a marvelous scene, with McQuarrie sharing quite an imagination for the details of the hunt. 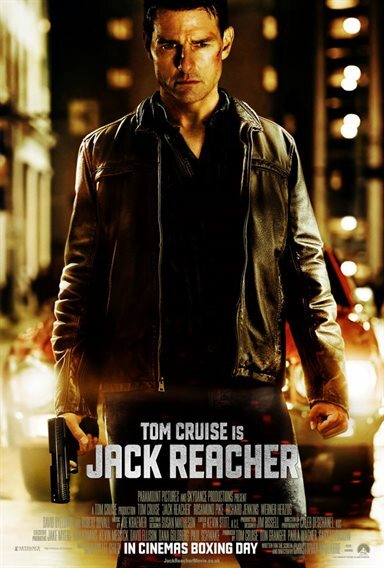 "Jack Reacher" is best fully enraged, using Cruise's trademarked thespian commitment to fuel the escalation, while supporting work from Pike (a pleasant English actress who shouldn't go anywhere near an American accent), Alexia Fast (as a young woman who regrets involving herself in an attack against Reacher), and Robert Duvall (as a gun range owner aware of Barr's instability and sniper skill) offers just the right level of disbelief, while the casting of Herzog brings menace and a wink to the villain role. Besides, who else but Herzog could play a man who once chewed off his own fingers to escape prison. McQuarrie's literary interests soon come to mummify his movie. "Jack Reacher" isn't a simple tale of revenge, but a complex mystery involving hitmen, associates of hitmen, and associates of the associates of the hitmen. There's plenty to take in, especially when the feature is more alert seeing red, enjoying Reacher as a man of action, not a shirtless Sherlock Holmes. Perhaps this is sacrilege to Child fans everywhere, yet the picture has its own life, working quite well as a visceral creation, not as an intricate to-do list of ho-hum double-crosses and puppet-mastery. McQuarrie sweats to turn the plot into a significant conundrum for the characters, but it doesn't take. In light of recent tragic events in America, there is some discomfort in seeing the film delight in gunplay, finding so much of the story tied to the particulars of shooting, especially the slaughter of innocents. This is not a criticism, just an unfortunate reality, and one that sensitive ticket buyers should keep in mind before entering the theater. "Jack Reacher" is uneven and surprisingly tedious when it gets caught up in meaningless plot specifics. However, the basics of intimidation and thrills remain in McQuarrie's work, generating a passably compelling film with a strong sense of star power from Cruise. While it doesn't seem likely to spawn sequels, I'd love to see another Reacher adventure, especially one that's easy on the complications and full-steam-ahead with threatening behavior. Download Jack Reacher from the iTunes Store in Digial HD. For more information about Jack Reacher visit the FlickDirect Movie Database.